What does a power meter do? An audio power meter shows how many watts are moving from the amplifier to your speaker. The electric meter does something similar, measuring the energy consumed by lights and appliances in your home. Perhaps you have an exercise machine that tells you how much energy you have expended in search of a better body. The gas pump tells you how much fuel (chemical energy) you are pumping into your vehicle. Power meters are all around us, except it seems between your vintage amplifier and speaker. The advent of the PM-150 changes that. Now you can know exactly how many watts your amplifier is putting out, at every volume setting, not just full power, up to 300 WATTS. The PM-150 also has a protection feature that keeps you from blowing your speakers. The PM-150 does not switch, or disconnect even briefly, the speaker signal between the speaker and amplifier. Rather, it decreases the input level to the amplifier to protect the speaker. Service technicians also use the PM-150 as a bench instrument to test guitar and bass amplifiers. What is a Watt? Why should I care? The watt is a unit of measurement that tells how much work is being done. For example, there are 746 watts in a horsepower. That means if your car has 200 horsepower, it puts out almost 150,000 watts! For amplifiers and speakers, you know intuitively that more watts = more sound. That’s true. Just how many watts equals how much sound is not well known because measuring amplifier power required expensive instruments until now. The PM-150 makes power measurement affordable. Your amp is connected to your speaker and you need to know how much power is in the pipe. Why use a power meter? Rig Reliability. You know that your amp and speakers sound better when you push them to the limit. If this were not true, then we would all buy 300 watt speakers for our 50 watt combo amps, and never kill a speaker again. But that 50 watt speaker sounds best with almost 50 watts going into it, when it’s working as hard as you are. We push to the edge and hope we don’t fall off. The PM-150 helps you run your gear at the optimum setting. Consistent Performances. You play in different venues every gig: Cement block rooms, carpeted clubs, halls, arenas, your bedroom. As a guitar player, I understand how difficult it can be just getting the levels right. When the sound tech tells you that you are way hotter than you were last night (your signal, that is), how do you know? Is your amp louder? Are your speakers placed differently? Did he mess with the controls on the board? 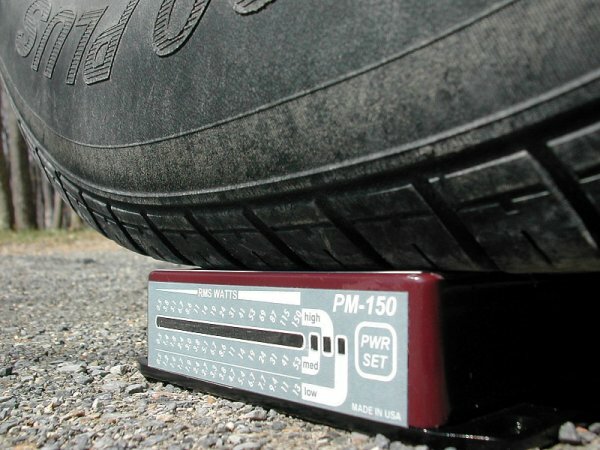 The PM-150 gives you a calibrated, bright readout of exactly how much power your rig is putting out. If it said 69 watts last night, and it says 69 watts tonight, then you can tell your sound tech to go play with his knobs, because your rig is dead on. Amplifier Power Output Changes. Did you know that the output power of an amplifier can change over time? Tubes age, which causes a long term drop in power. The worst culprit is the voltage of the power line which sags and surges and has a different value everywhere you play. Some of the places I have played had outlets that looked like they were from Edison’s day. Hook up a few amplifiers to those outlets and the voltage drops fast. With the PM-150, you can adjust the volume on your amplifier to compensate for power line variations, knowing that your speaker is seeing just the right power at every gig. Protect Your Investment. I have a wonderful pre-CBS Fender Deluxe Reverb amplifier that is older than some of my bandmates. The last thing I want to do is destroy a speaker and damage my old friend. The PM-150 helps me monitor my power and automatically turns down the amplifier input when I overdo it, protecting my speaker and amplifier. I can wail all I want, knowing that it will never result in real smoke and flames. NO TONE CHANGE. The PM-150 does not change the tone or amplitude of the signals passing through it. The signal paths run from jack to jack in the PM-150, with practically zero resistance, and the enclosure is made out of metal which shields the signals from noise. How is the PM-150 used? Use high quality cables for best results, as you would with any installation. The front panel of the PM-150 has just one button that you use to set the power range and speaker protection power limit. The PM-150 has four power ranges, 13 watts, 53 watts, 150 watts and 300 watts RMS. Holding the button cycles through all ranges and power limits. The bright bar graph display of the PM-150 shows the power going through at any point in time. It’s easy to see from across the stage, even when the rest of your band is blaring. If you go wild and exceed the speaker protection power limit, the PM-150 decreases the signal going into the amplifier and blinks its power display to show you what happened. One touch of the front panel button restores the amplifier input signal path, presumably after you turn down a little! Great for bench testing amplifiers! Several of our customers are amplifier repair or manufacturing technicians who use the PM-150 on the bench to test amps. The PM-150 makes a great tool to get a quick read on amplifier output power, and works with both inductive speakers and resistive dummy loads. If you need help installing or using the PM-150, please see our contact page. You may call or email. Our goal is to help you get maximum value out of the PM-150, so please call or write if you have a question or problem. Technical support is FREE. The PM-150 package includes the power meter, power adapter, user manual, free support, and mounting hardware. We will accept your money order or check — please contact us. Due to governmental regulations, this product is available only in the USA and Canada! The PM-150 is also for sale using our secure PayPal shopping cart. There is a 30-day money back guarantee. If you are not satisfied for any reason in the first 30-days after purchase, you may return the product for a full refund.